The Lord settled with him a covenant of peace, and made him a Chief, that he may have the honor of Priesthood for ever. O God, the rewarder of thy faithful servants, who hast consecrated this day by the martyrdom of blessed Apollinaris, thy Bishop: grant, we may obtain entire pardon of all our offences by his prayers whose memory we celebrate on this present festival. Through our Lord Jesus Christ, thy Son, who liveth and reigneth with thee, in the unity of the Holy Ghost, God, world without end. Amen. Image Description: St. Peter sends St. Apollinaris to Ravenna to convert the city. Ravenna, the mother of cities, invites us to-day to honour the martyr bishop, whose labours did more for her lasting renown than did the favour of emperors and kings. From the midst of her ancient monuments, the rival of Rome, though now fallen, points proudly to her unbroken chain of Pontiffs, which she can trace back to the Vicar of the Man-God through Apollinaris. This great Saint has been praised by Fathers and Doctors of the Universal Church, his sons and successors. Would to God that the noble city had remembered what she owed to St. Peter. Apollinaris had left family and fatherland, and all he possessed to follow the Prince of the Apostles. One day the master said to the disciple: “Why stayest thou here with us? Behold thou art instructed in all that Jesus did; rise up, receive the Holy Ghost, and go to that city which knows him not.” And blessing him, he kissed him and sent him away. Such sublime scenes of separation, often witnessed in those early days, and many a time since repeated, show by their heroic simplicity the grandeur of the Church. Apollinaris sped to the sacrifice. Christ, says St. Peter Chrysologus, hastened to meet his martyr, the martyr pressed on towards his King; but the Church, anxious to keep this support of her infancy, intervened to defer, not the struggle, but the crown; and for twenty-nine years, adds St. Peter Damian, his martyrdom was prolonged through such innumerable torments, that the labours of Apollinaris alone were sufficient testimony of the faith for those regions, which had no other witness unto blood. According to the traditions of the Church he so powerfully established, the Holy Spirit in the form of a dove directly and visibly designated each of the twelve successors of Apollinaris, up to the age of peace. He lay hid sometime in the house of certain Christians, and then went to Ӕmilia. Here he raised from the dead the daughter of Rufinus, a patrician, whose whole family thereupon believed in Jesus Christ. 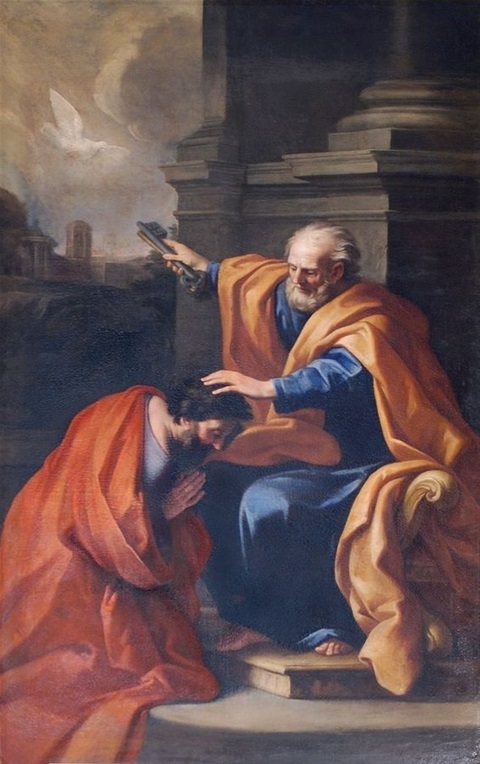 The prefect was greatly angered by this conversion, and sending for Apollinaris he sternly commanded him to give over propagating the faith of Christ in the city. But as Apollinaris paid no attention to his commands, he was tortured on the rack, boiling water was poured upon his wounds, and his mouth was bruised and broken with a stone; finally, he was loaded with irons, and shut up in prison. Four days afterwards he was put onboard ship and sent into exile; but the boat was wrecked, and Apollinaris arrived in Mysia, whence he passed to the banks of the Danube and into Thrace. Another account of St. Apollinaris. Also Read – July 23, 2018: St. Liborius, Bishop and Confessor. St. Apollinaris, pray for us.